I work in a team at the National College that is widely distributed across the country. One way in which we ensure that we keep in touch with each other and share what we are working on and learning, is to have a quick, voluntary web conference at 9AM every Friday morning, led by different members of the team on different days. I find that the most enjoyable and fruitful of these sessions is where one of us talks about an area of work or interest that is unconnected with our work at the College and where we push and invite ourselves to think about what lessons we have learned from that area that might be of benefit to the College. I’ve led a few of these sessions recently and this blog post is a write up of one of those. A useful way that I have found of preparing for these sessions is to focus solely on the lessons that I have learned from the particular project or area of work and to note these down, as they occur to me and often while I’m travelling, using the Simplenote app on my phone. 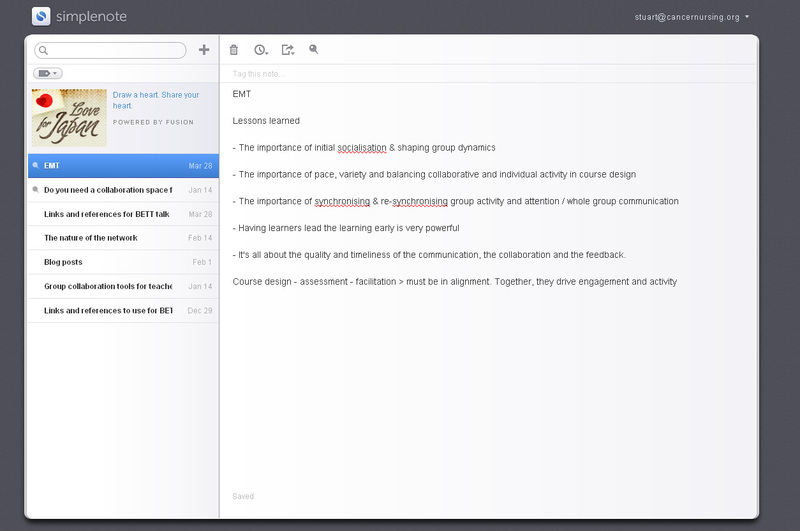 One of the lovely things about using Simplenote is that your notes are synchronised to the Simplenote service on the web and, when viewed on a browser, a page of notes in Simplenote is often handsome enough to be used as a presentation. So, your focus is on the content and not its presentation. It’s all about the quality and timeliness of the communication, the collaboration and the feedback. I’ll take each of these ‘lessons’ in turn and make a few comments about each. The importance of the initial socialisation of learners cannot be underestimated. Nor can the influence of the tutor in the very early days of the course in nurturing group dynamics and setting the tone for the course. Initial socialisation ought to be an explicitly ‘designed-in’ part of the early course activities. Similarly, online tutors need to make time for, and pay real attention to, the timeliness and the tone of their very first acts of communication with their online learners. You may have learners in your group who have never been part of an online course before or who have little experience of online collaboration. On the other hand, you may have more technically-savvy people in the group who baulk at having to spend a week working on icebreaker and introductory activities. Explicitly designed socialisation activities are valuable for both of these groups, even for the resistant tech-savvy learners. New or hesitant or anxious online learners will appreciate the gentle pace and the opportunity to get to know each other and the technology before they have to use it in earnest. The impatient, tech-savvy learners can be taught, often by some persuasive interventions and direct messages by the tutor, that the needs of the whole group are important and that their skills can be valuable and put to good use to enhance the collaborative activities they are to engage in. When time is taken to nurture initial socialisation and shape group dynamics comprehensively at the start of a collaborative online course, it can pay dividends almost immediately and thoroughout the course in the quality of communication and collaboration that takes place. Getting the pace right, ensuring a real variety of types of task and balancing collaborative and individual activities within course design can make a huge difference to the success of the course. You maximise your chances of satisfying the majority of your learners if there is a good deal of variety in the types of task they are asked to do (both individually and in groups). You give yourself focused periods where individuals can receive more detailed feedback by placing individual activities at key points in the course. You give learners the flexibility to plan and use their time as they wish by interspersing periods of collaborative activities, where the commitment to the ctivity requires a more regular input, with individual activity, where individuals can work at their own pace they wish as long as they meet the deadlines for activities. The pace and the sequencing of activities can make or break the success of a collaborative online course. When you always have something different around the corner – either the opportunity for the individual to stretch out and follow their own interests or the opportunity for the individual to be supported and stimulated by the group – then you have a structure that can lead and pull and support learners through to completion. Good online courses will continually finesse the pace and sequence for fresh iterations of the course and they will grant online tutors the flexibility make some alterations to pace and deadlines in response to the dynamics of each cohort. While a well-designed course structure supports learners and groups to work flexibly and asynchronously, I’ve found that it’s important for the momentum and focus and energy of the group to have key points where learners’ activity and attention is regularly synchronised. This is achieved partly by the placement of focused collaborative activity within the course and also by regular whole group communications from the tutor. On the EMT course, I made a point of sending out a whole group circular every Sunday evening which looked back at recent activity, outlined and repeated expectations of forthcoming activities, distributed a few nudges about deadlines that still had to be met and praised the good work that had recently been completed. To create a sense of where the group are at and what they have in front of them feels very important where learners are never brought together physically. Designing your course so that learners lead and summarise discussions early on is a powerful way to enhance the confidence of learners, to reduce a sense of dependency on the tutor and to indicate that we are all learners in the group. Creating an expectation in your group that at different points in the course different people will lead group activities is a potentially powerful way of challenging learners and allowing them to flourish. It’s not about the tools and the technology. It’s not even about the learning design on its own. You can have great tools and excellent learning design in a course and it can still fail if the quality and timeliness of the tutor’s communication and feedback and the quality of the collaborative activity in the group fall short. It is in the hands of the tutor to make sure that neither of these happen. Course design, assessment and facilitation must be in alignment. Together, they drive engagement and activity. This is an extension of the last point and one which I felt very powerfully in this recent run of EMT, which I think gets these three elements right. When course design and facilitation and assessment are coherently and thoughtfully aligned, together they will drive the engagement and activity of the learner. When they are out of synch we make things harder for learners and tutors alike. If a fantastically-designed set of activities do not contribute towards the assessment of the course, expect learners to give them less than their full attention. Similarly, if a poorly-designed set or sequence of activities carry a heavy part of the completion criteria, expect some learner resentment and for the tutor to be overburdened at that point in the course. If you are facilitating too much activity that is not assessed; if you are assessing too much activity that is not facilitated; if you are facilitating too much activity that is not an integral part of course design; if you are designing too many activities that are neither assessed nor facilitated – do not be surprised if engaging learners and satisfying tutors are much harder than they really should be. These design faults and issues are symptomatic of a learning design where the e-learning component of a course or programme is bolted on rather than integral to the course. Sadly, this is still too common in the design of many programmes. When you have a coherence and a synergy between course design, assessment and facilitation this will drive and support the engagement and activity of your learners.